1 of 5 Heat a gas grill to medium-high or prepare a charcoal grill with medium-hot coals. 2 of 5 Stir together mustard, 3 tablespoons oil, honey and 1/4 teaspoon each salt and pepper. 3 of 5 Lightly coat grill with nonstick cooking spray or oil. 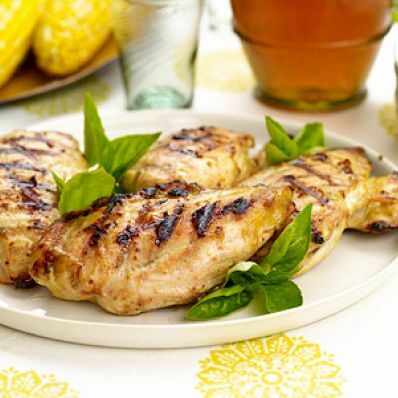 Place chicken on the grill and brush generously with mustard mixture; cover and grill for 5 minutes. Remove cover and flip breasts, baste generously with sauce and cover. 4 of 5 Continue flipping chicken every 5 minutes, basting each time, for about 18 minutes or until internal temperature registers 160 degrees on an instant-read thermometer. 5 of 5 Meanwhile, brush corn with remaining tablespoon oil; sprinkle with remaining 1/4 teaspoon each salt and pepper. Wrap corn in aluminum foil. Grill corn, turning once, about 18 minutes or until tender. Serve alongside chicken.